I waded after Simon into the waist deep muddy pond, careful not to loose my balance or else let my head slip underwater. A large watermelon sized ball of densely packed fiber suddenly floats to the surface. Yep, I willingly put myself in a pool of elephant dung. How did it come to this? 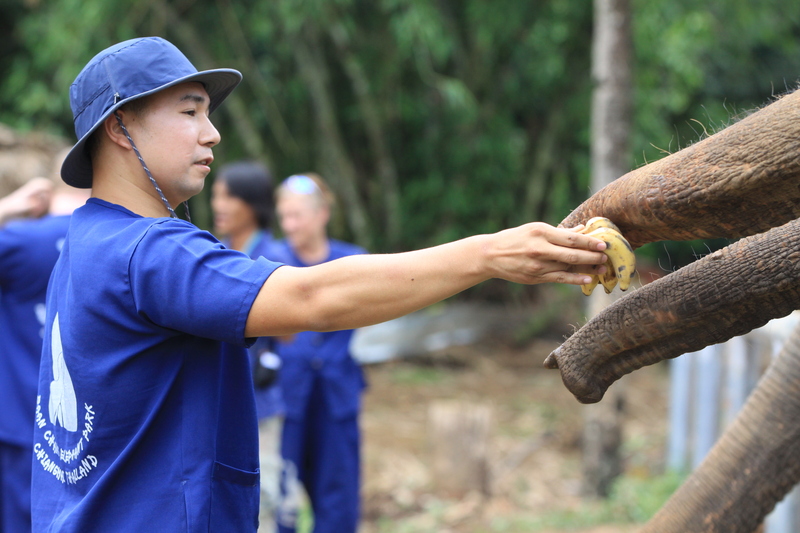 Simon and I became top chefs since arriving to Chiang Mai, and now it was time to become mahouts, which is an elephant caretaker and trainer. Elephant parks and sanctuaries where you can get up close and personal to these giants are plentiful, though the care and quality that the elephants receive will vary. The only thing that was important to us in choosing a camp was that the elephants were properly cared for, as opposed to the ones whose primary interest was that of attracting tourists. 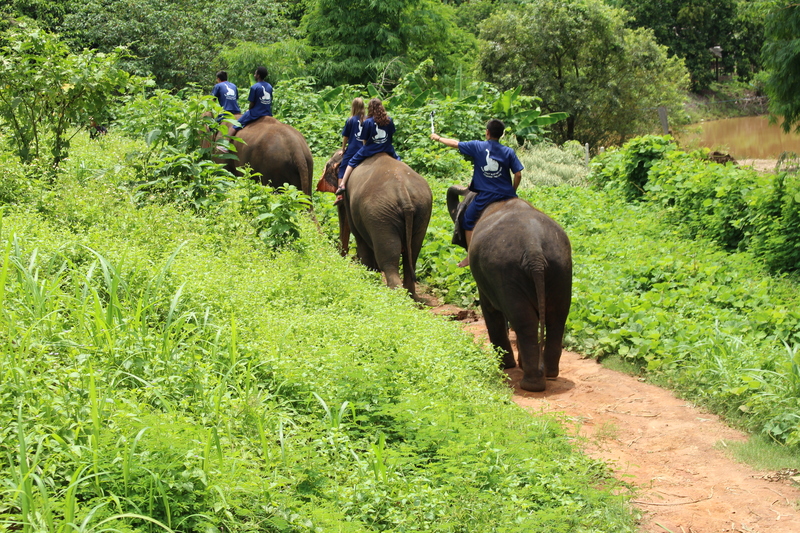 The Baan Chang Elephant Camp fit the criteria, and so we signed up for a full day of mahout training. 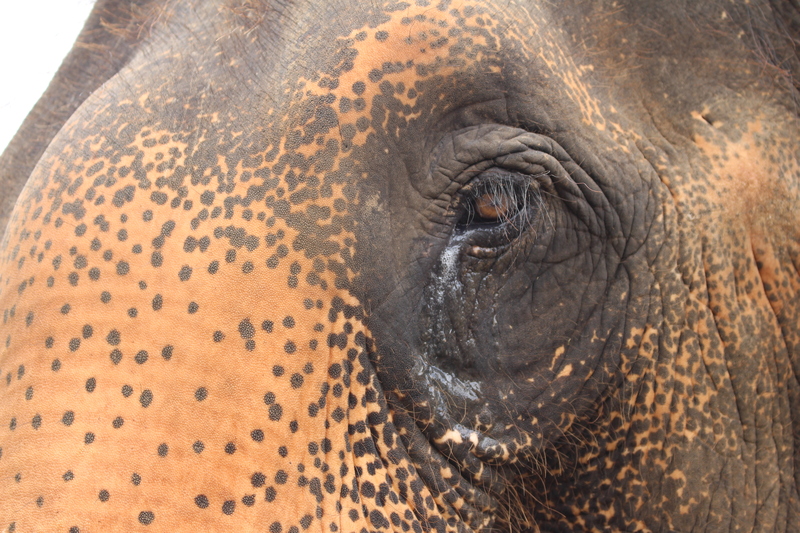 Our mahout was a soft spoken young man, with kind eyes and a gentle demeanor. Mahouts run in his blood – his father was one, and so growing up around elephants, he naturally developed a passion for these majestic animals. 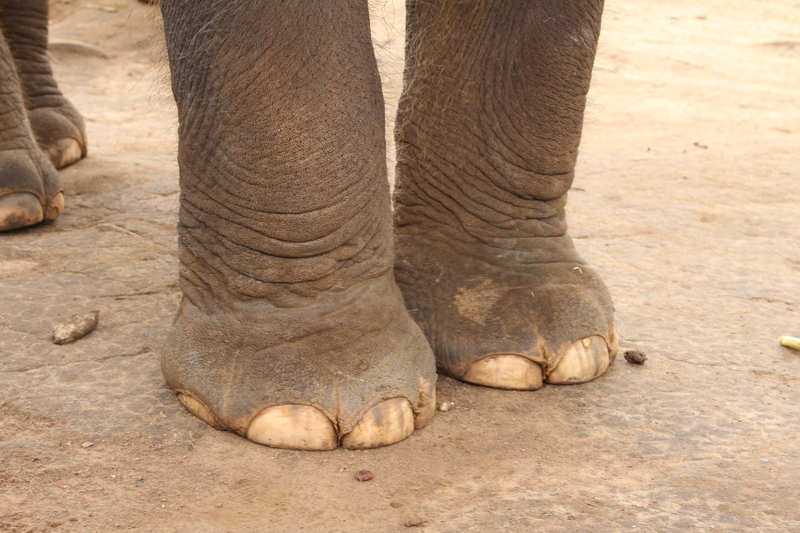 Every elephant is paired with a mahout for life, and most start this lifelong career when they are just boys. Elephants have their own individual personalities and temperaments, and mahouts must train with them for a while to gain their trust. For a such an enduring companionship, it is no wonder these gentle giants have to be picky about who they will trust. To become a mahout, one must at least dress like one, and our drab tourist attire simply wouldn’t do. 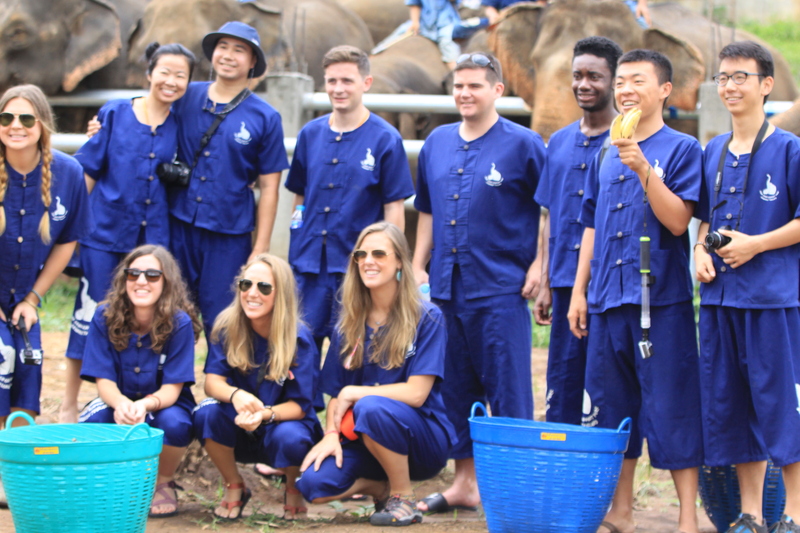 We were given a mahout uniform for the day, which was a very unflattering boxy unisex button-up and matching pants. It was easy to identify who were the rookies and who were the veterans, for we looked like fools in our navy pajama set. Our first task was to feed the elephants. Simon and I each grabbed a handle of the rather heavy basket of bananas and sugarcane, and lumbered out to the open feeding area. Dozens of elephants, large and small, were lined up in a row behind a fence made of two horizontal metal bars, the only barrier preventing the enormous animals from stampeding their way towards their meal and the foreigners that carried them. The mahouts were perched on the elephants with ease, watching us with a skeptical eye under their hats; their skin was evenly tanned and weathered, a testament to their dedication and hard work at the elephant sanctuary day after day under the sun. The elephants’ thick trunks were draped over the metal barrier, curling and waving to show off their dexterity, while their rounded wide ears flapped animatedly at the sight of food. Yes, there was a banana in my hand and I was excited to see them. I gingerly handed out my banana with an outstretched arm to the closest elephant. The agile trunk wrapped itself around the food and quickly shoved it into his hungry mouth. Frozen in place, I was startled by his strength – he could’ve very well yanked my arm off if I didn’t let go of the banana fast enough. We were outnumbered by the giants, which resulted in a feeding frenzy and competition of who was the biggest and quickest. Multiple trunks came towards me to swipe the bananas and sugarcane from my hand. Those with the longest and strongest trunks would swat at each other, beating out the smaller ones whose tinier trunks often fell short of my reach. Feeding time was just a teaser, and now it was time to get serious for mahout training 101. We learned the basic commands: non long (kneel down), pai (go straight), kway (turn), and how (stop). Our mahout wrote each of the words on the dirt ground with a stick as he explained them, and I quickly forgot them no sooner than he erased it to write a new word. Clearly I was going to be in trouble, and imagined myself on a runaway elephant that I couldn’t control because I could only remember pai. They brought over two elephants, a large one, and an even larger one. 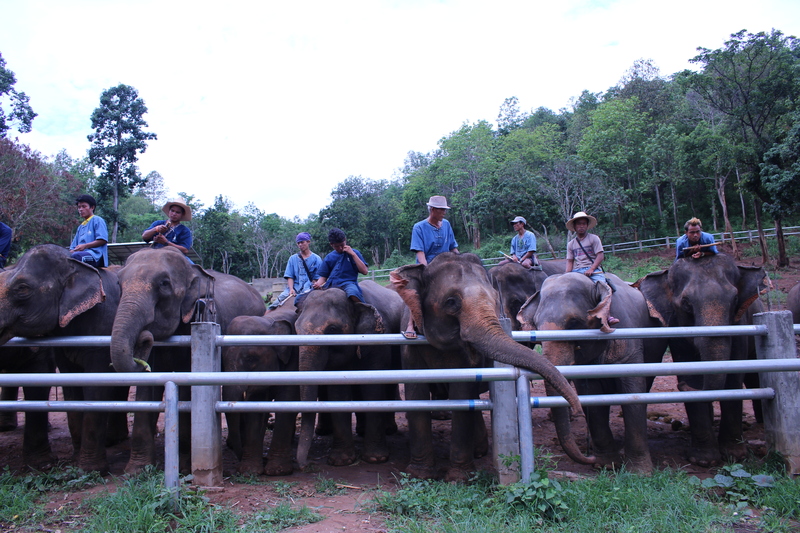 Still shaken by their strength and size, I was surprised to find myself volunteering to be one of the first two trainees to practice my newly learned mahout commands. Saddled barebacked on her bristly neck, I felt like I was going to topple over her head with her every step. Her ears flapped against my legs, while her coarse stiff hairs grazed my skin. With her mahout walking alongside us, she slowly lumbered forward, giving me a chance to practice all the commands I had learned just moments ago, but now jumbled confusingly in my head, mixed in with a rush of adrenaline. I’m on a mother effing elephant! After everyone in the group had a chance to practice, it was time for the real deal. We were paired up, and there was no fight between Simon and me about who would get to be in the driver’s seat. He naturally took the lead on the elephant’s neck, holding onto the cranial ridge for support while I was straddled uncomfortably on her back. I had nothing to hold onto except for two small metal rings that were strung on a rope around her body. This was going to be even harder than I thought. The elephants treaded through the well worn dirt path in a row, carefully guided by their trained mahouts on the ground. For a whole hour I held onto dear life, my hands aching like arthritic fingers locked into a death grip on the two tiny metal rings. I still couldn’t believe I was on top of this gigantic animal, and the feeling of her strong sturdy body moving rhythmically beneath me was surreal. I could feel the impact of of her hefty tree trunk legs striking the ground as she lumbered forward with every step. Compared to her five ton body, Simon and I probably felt like flies on her back. The park was vast and lush with vegetation, a true sanctuary for elephants to play and eat, and the view from atop her back was simply amazing. We could touch the trees and sometimes had to dodge a branch or two. Driven by appetite, one of the elephants in the group went off trail to snag a tasty meal of leaves, causing the poor mahout-trainees on his back to wail out in fear. 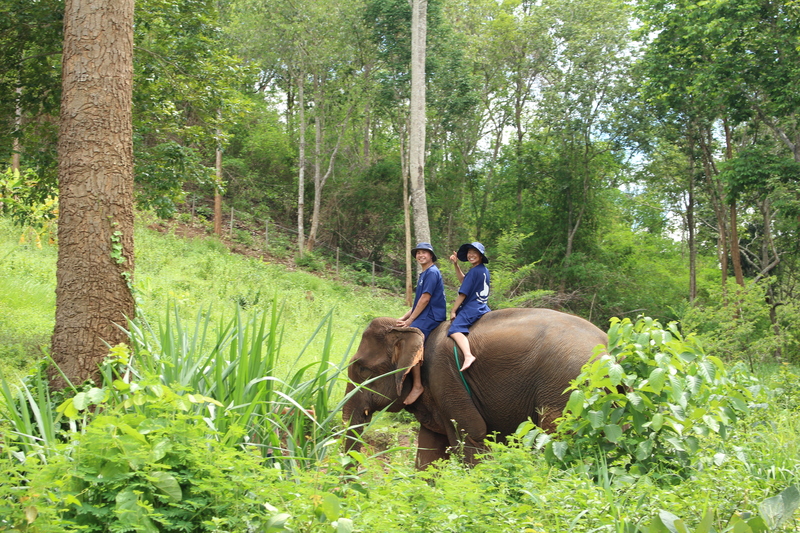 Even the experienced mahout leading the elephant had trouble reigning him back onto the path. Like witnessing the aftermath of a car accident on the highway, Simon and I bypassed the mayhem with little harm, though some rubber necking was involved. Thank goodness that wasn’t us, for our elephant was obedient, giving us very little trouble. After an hour long march through the flora, the elephants were tired and hot. At the end of the trail was a large muddy pond – apparently elephants love to play in the water. No sooner did we all dismount our elephants, than they trudged into the shallow pond and kneeled down, their bodies half submerged in the water. We, the mahouts in training, were invited to join them. With a large pail and scrub brushes thrust into our hands, I too, found myself plodding towards the muddy waters, though somewhat reluctantly compared to Simon’s gleeful enthusiasm. We splashed water on our elephant, poured buckets over her head and scrubbed her with our brushes. Her wet leathery skin glistened in the sun. As I put my hand on her back, I closed my eyes to heighten my sense of touch. Her rough skin was warm yet also cool, and my sensory receptors were firing with activity upon contact with the wrinkly grooves and prickly hairs of her thick skin under my fingertips. I felt her elephantine body heave up and down with her every breath. It was surreal that I was this close to her. My brief moment of zen and wonderment was interrupted by an unexpected shower of water on my head. As it turns out, elephants like to play tricks. First sucking up the pond water with their adroit noses, the elephants would then raise them high up in the sky and blast away, sending the water spewing into the air. It drizzled down in a fine mist, causing surprised cries and laughter from all of us, the unsuspecting victims, while the elephants trumpeted with amused glee at their mischievous prank. One of the mahouts waded into the water in his tee shirt and jeans, carrying a large woven sack with him. What was that for? Then it dawned on me that those fiberous muddy brown spheres the size of basketballs floating to the surface was elephant dung, and that he was the dung collector. Only at mahout training would I ever experience this. Only in Chiang Mai. In the end, soaked with dung water and mud caked feet, we said goodbye to the elephants all too quickly. 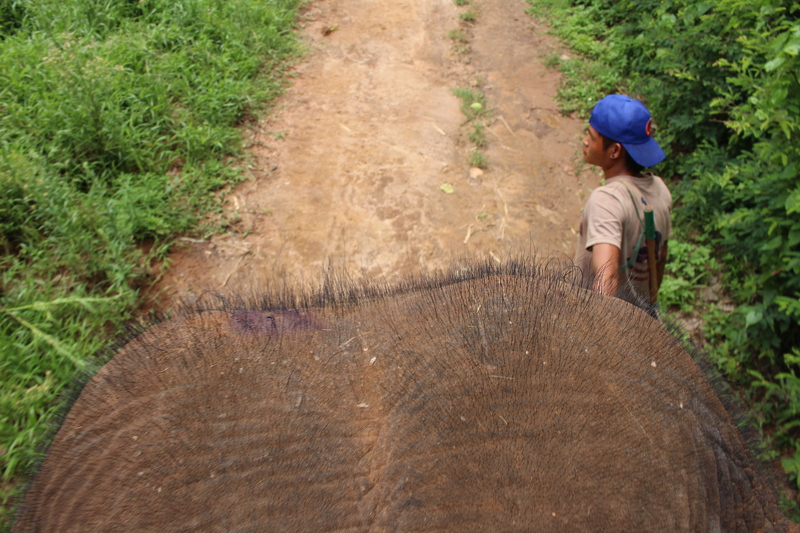 Although it takes many years for an elephant to bond with its mahout, in a few short hours, I felt like Simon and I already made a connection with ours, and no future elephant encounter will ever be the same. They say that elephants never forget, and surely it will be this experience that is unforgettable.